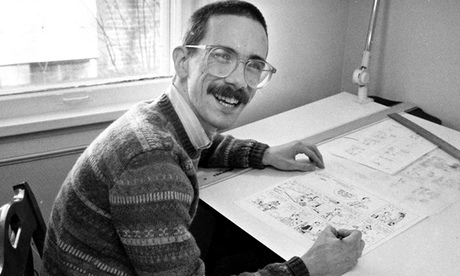 For an alleged recluse, Bill Watterson has been getting around quite a lot recently. Well he hasn’t, but his work certainly has. On Wednesday, the latest work from the legendary creator of Calvin and Hobbes was unveiled. It is a comic strip poster that promotes the upcoming Angouleme International Comic Festival, which will be held in France between 29 January and 1 February in 2015. You can check out Watterson’s latest work below. I think you’ll find that it’s both amazing and proves that the iconic artist has in no-way lost his touch. As you could have probably guessed, the famously publicity shy artist won’t actually attend the event to promote or discuss his work. The dialogue-free piece revolves around a man simply trying to pick up his newspaper. The balding man in his pajamas then finds himself locked outside of his house. His dog then makes things umpteen times worse by ripping off his pants after he has broken his window and as he is trying to climb through it. Obviously, Watterson’s superbly precise and light illustrations bring the piece to life in a poetically beautiful way. Watterson also provided an interview with a French magazine that explained his methods behind the piece. He also admitted that he didn’t use any text so that a wider audience could appreciate his work. This comes a few months after Watterson drew the poster for the film Stripped, which revolved around the comic strip. He even went as far as to provide an audio interview for the documentary too. Watterson, who is often referred to as the JD Salinger of the cartooning world, as he is rarely seen in public and doesn’t give interviews, has also been involved in several other projects over the last few months. Watterson was a guest artist on Stephan Pastis’ Pearls Before Swine, while in March an exhibition of his work, Exploring Calving and Hobbes, was displayed at Ohio State University’s Billy Ireland Cartoon Library and Museum. Calvin and Hobbes was a daily comic strip that ran from November 18, 1985 until December 31, 1995. At the height of its popularity, it was syndicated in 2,400 newspapers across the world.